When it comes to office coffee, many coffee makers are known to produce a few cups of coffee per brewing. The Keurig Bolt Z6000 carafe brewing system is all about making a difference as it can brew an entire pot at a go. This coffee maker brings quality, simplicity, and convenience all wrapped in one system. We are going to look at the features making this coffee maker gain popularity in offices compared to other office coffee machines. We write earlier best office coffee maker and we not include Keurig Bolt coffee maker in our list but now when we use it we need to change that list. • Unlimited back-to-back brewing through direct water plumbing feature. Uses Flavored K-Cups– Like all Keurig coffee makers, the Bolt z6000 coffee brewing system uses k-cups which are a bit larger and designed specifically for this machine. Additionally, the k-cups, which in this case are known as the bolt packs come in a variety of flavors including Timothy’s World Coffee, Original Donut Shop, Green Mountains Coffee, Van Houtte, and Tully’s. Big and Fast– The coffee maker has an added advantage that it can brew a 64oz. coffee pot in just 2 minutes. This is half the time a typical office coffee maker will take to brew. The thermal carafe of this machine can maintain the beverage fresh, hot, and tasty for up to two hours from brewing time. Easy to use– the bolt packs are recyclable with the machine offering one-touch brewing. 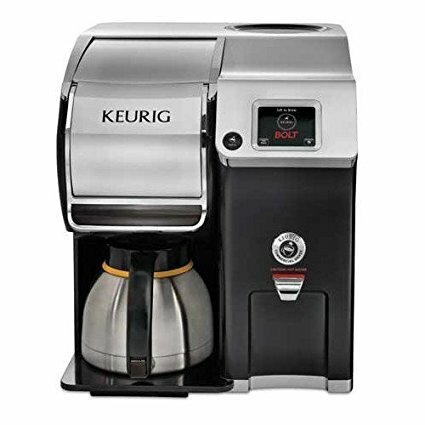 It features a 3.5 inch LCD touchscreen display that makes it easy to program automatic brewing. This coffee maker is also made such that it can detect when the carafe lid is open and avoid brewing hence causing no mess. This coffee maker is convenient for any setting that includes a group of coffee drinkers including an office, cafeteria, or a hotel. Keurig Bolt Z6000 carafe brewing system has a lot of benefits to offer users including the fact that everybody can share their love for coffee at the same time without lining up. Provides consistency regarding taste and quality – bolt pods are sealed hence keeping your coffee ever fresh. The fact that coffee is always pre-measured maintains your coffee fresh with an excellent and consistent taste. Speedy brewing – unlike other 120V coffee brewers that takes four minutes to brew 64 ounces coffee, the Keurig Bolt takes only two minutes. Convenient– the k-cup pods makes brewing with this coffee maker fast since there is no pre-measuring. The brewing process is also without mess as there are no chances of spilled ground means or messy filters. Efficient – this coffee maker features a thermal carafe and an LCD touch screen display that makes it easy to brew by providing instructions in Italian, French, and English. Programmable and dynamic color touchscreen – you can adjust the temperatures, date, and time as you like, not to forget the auto ON/OFF features that tune the machine accordingly. This feature makes it easy to brew and dispense hot water without applying much effort. Certified – this coffee maker is approved by the UL Commercial listing, with the thermal carafe and the bolt brewer further certified by the National Sanitation Foundation. Easy to use – the Keurig Bolt Z6000 carafe brewing system makes coffee at just a press of a button without making any mess. It consequently requires less cleanup. The only downside of this coffee brewing system is that it is large and hence requires a lot of space on your counter. Keurig K200 vs K200 plus – Are there differences between this Keurig coffee machines? Difference between the Keurig K55 and K200 – Which Keurig model is better for you? Difference between Keurig K150 and B150 – Different name but.. Smallest Keurig Coffee Maker – Which Keurig Machine Is The Smallest? Keurig with the largest water reservoir – Which model has the largest water reservoir? The Keurig Bolt Z6000 carafe brewing system is a convenient machine for institutions where there are groups of coffee lovers. The manufacturer had thought of allowing coffee aficionados share their common love for coffee by making it a 64 oz. brewer. 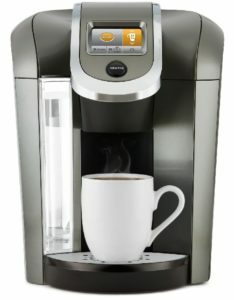 Additionally, they added the convenience of this coffee maker by producing variety flavors of the k-cups. Being a commercial brewer and having pods specifically designed for this coffee machine makes it a bit hard to find the coffee beans. However, you can always buy them in variety online. With the ability to keep coffee hot for long, it will be the most suitable for offices where no one is stationed at the kitchen.